I get up at 8:00, and get ready and go down to breakfast. I used to like this little hotel, but something seems amiss. The bathroom was in need of repairs, and the breakfast was a mess; and to add insult to injury, they charged a supplement for the breakfast. Not good. I go over to the Centre Pompidou, walking up from Chatelet. There is a wind blowing dust off the decomposed granite that forms the parvis, so I decide not to wait at the door, but rather go to St. Merrie, right by the Stravinsky fountain. It is closed, so I circle back and have a coffee at the Cafe Parvis. Finally it is close enough to 11:00 to go down and wait. I go to the door for those holding museum passes and then get to watch the battle of the bureaucrats - as only the French can wage them. All of us with museum passes are at the wrong door, in spite of all the signage and must move. (Sigh). I want to do two things. 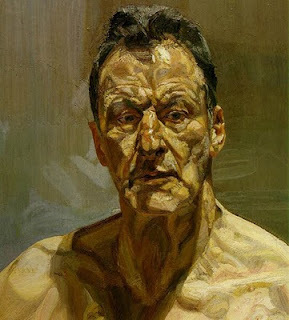 I want to see the Lucien Freud exhibition, and I want to see their French Painting series. 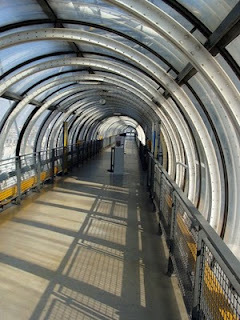 The escalators up the tubes that run up the sides of the center are really a delight, and when you get to the top, a whole panorama of Paris opens up to you. It was, oddly enough, rather a surprise. So, like everyone else, I pulled out my camera and shot the rather misty scene. I immediately have to go down to get a special ticket for the Lucien Freud Exhibition, and on the way down I see a sign, "Niveau cinq est ferme". In other words, my goal of seeing the center's spectacular collection of contemporary French painting was not going to be realized. This seemed to be in keeping with other developments on this trip. Oh, well, next time. First of all it's wonderful to see so many paintings by this grandson of the founder of psychiatry gathered into one place. I am immediately struck by the affinity these paintings have to the work by Francis Bacon. Both seem to place their subject(s) on/in a defined space, a platform if you will. Bacon expresses it with lines of paint, or a literal platform. For Freud, the platform can be a chair, a bed, or a pile of rags. In both the flesh seems almost super real, and Freud seems to use an impasto technique when dealing with the face. In a Bacon paintings, the face is usually a smear. Bacon paints in the motion, while Freud implies it. One painting, Two Plants, (whose title suggests a nice quiet still life) is really two plants growing wild in his backyard (garden, would over represent the reality) which fill the canvas with form and life. These were wonderful paintings for me. I try out the other floors, but find it not very engaging. I kept thinking of Serra's chunk of melted aluminum sitting in a permanent gallery at SFMOMA. Other galleries reveal the French obsession with beauty and design in shows of everyday objects, which look like commercials for Alessi and JC Decaux. The other stuff is all experiential and difficult to read or take in. It's time to go. I think about Monet at l'Orangerie, but decide against it. It's time to go to the Louvre! I head straight for Sully and the Egyptian Collections, which have been reordered, yet again - to good effect. 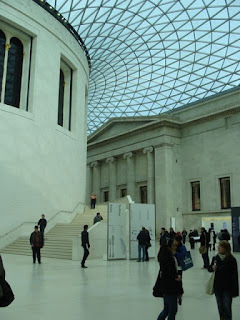 (And here the British Museum, in spite of all its holdings, just fades in the comparison.) 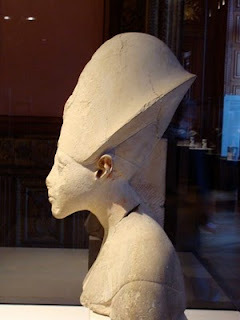 I am again looking for Amarna artifacts and find many - all of them very engaging and lovely. I spend a great deal of time in these galleries. I then walk down to the Italian painting section, and on the way bump into my favorite, my icon of truth and beauty, The Nike of Samothrace. She never fails to amaze me. While I'm looking at Da Vinci paintings, I think, "What the hell, let's go see the Mona Lisa." Interesting, now you can't get closer than 5 meters from her - and behind plexiglass too. What a shame. Time for lunch - and there's a lovely place in one of the Denon stairwells. I meet some people from Greece, and we take each other's pictures. I have a quiche and a sparkling water. Now I just roam. 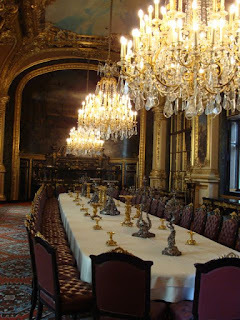 I always like the Napoleon III Apartments, so I go there, take some time in the medieval section, especially with the treasures of Saint Denis, gathered by the formidable Abbot Suger, discover a special exhibition of sculpture from the Borghese family, and then look for some Poussin. All the while I'm doing this I'm attempting to find a collection of vestments worn by l'Ordre de Saint-Esprit, ordered by Henri III in 1548. I can't find reference to the display on any of the maps, but suddenly stumble upon it late in the afternoon, saying quite loudly, "Yes!" By then it's time for tea - and a raspberry clafouti, which was delicious. By this time I'm biding my time, needing to use up time until my train leaves. I retake some photos, which I accidentally deleted back in 2006. 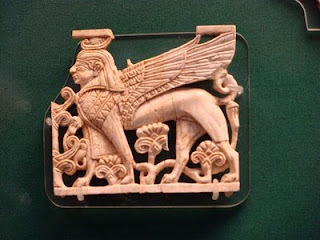 I look at the Assyrian, Babylonian, and Sumerian stuff again, and try to find a Ba'al mounted on a calf or bull. No luck. I do find this excellent Ba'al, however. I'm tired at this point and go to the Carousel, get a sparkling water and write until 7:00. I then make my way to Gare du Nord, and get on my train, and sleep my way back to London. 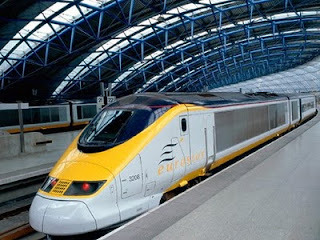 Today is Eurostar day! 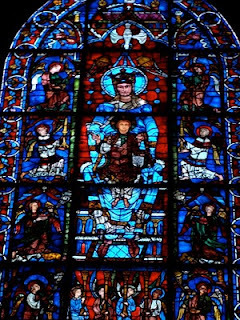 Better than that it will be a Paris day, and even better than that it will be a Chartres day! I get up early and get myself over to St. Pancras International. Very nice set-up. You check in and then are ushered past passport control (you enter France in London) and then to a nice waiting area with restaurants, etc. I buy a water and an egg mayonnaise (read egg salad) sandwich and wait for the gate to open. The train is really quite ordinary, the Thalys in France, and even Regionali in Italy seemed nicer. I am excited, however. 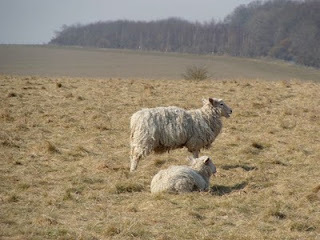 We pass through the English countryside, and I am thinking of our tourguide's (Rodney) (he was the tourguide on the Windsor, Bath, Stonehenge tour) remarks about the disappearance of hedgerows in England. Apparently not here. They are still present and give the countryside that "counterpane" kind of look. It is quite lovely. It is cloudy and grey, however. As we go into the chunnel, I fall asleep. Suddenly it's all light and we are in France. The whole countryside has changed. There are large fields, and the evidence of lots of investment in infrastructure. (On the return trip, I will find that I was seated on the wrong side of the train to see the English investment.) The sun is shining and there are a few clouds in the sky - but it is sunny! Lot's of windmills - the big kind. Soon we are in Paris and it is a big change from London. The graffiti is everywhere, above ground, underground, you name it. The Paris Metro has more spacious cars, and those rubber wheels on M1, but they are just as noisy, and the stations seem cramped and dated. (The London Underground is seeing a great deal of modernization, and the stations are generally clean, well-lighted and filled with information - not true in Paris). But I'm in Paris - who cares! I take the 5 to my hotel (Croix de Malte) and check in (the room won't be ready until 13:00) so I leave my briefcase with the clerk, and head out. 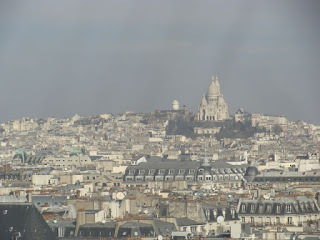 I take the 5 to the 1 and then the 12 south to Montparnasse. I try to use one of the kiosks to by a ticket to Chartres, but they require a card with a chip. (Sam Tuohey explained this to me: America uses phone rather than chip technology to speed transactions on cards - so we're at different points with this.) I have to go to a window. The ride down is slow (8 stops), but comfortable. One of the stops is at Versailles/Chantier, and we go to the South of the palace and great park, which I can see from the train window. I could go there forever, and never get bored. 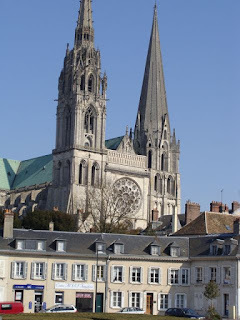 When I see the cathedral from the train it looks small to me, but it's a matter of perspective and situation, not size. Outside it is bitter, bitter cold, and as I approach the cathedral, it is clear that they are doing major work. The whole west end was unapproachable. I go in the south portal, and I have a Nike of Samothrace moment. I weep at the beauty. Artificial lighting is kept to a minimum in the cathedral (as well as the heat - I suddenly realized the value of fur-lined cassocks) so you really get the feel of a medieval building. There are lots of people, mainly Japanese. I'm surprised, because I didn't see any tour buses. 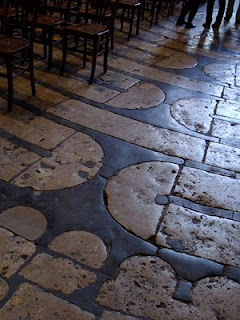 I notice the labyrinth in the floor, and it is beautiful. Most people are ignoring it. The plan is to make about 3 or 4 circumambulations, and then go outside. I notice flowers at the altar, and I see that a priest is preparing the chancel. There is going to be a funeral, and soon pall bearers (four of them) enter the church with a wooden casket on their shoulders. The priest accompanies the widow, and the organist is murdering Bach. Time for tea! This is a charming little tea room run by an English couple. I have a tarte au citron and some black tea, and rest. When I think the funeral is over (indeed the bells are tolling) I go back - but the organist is still at it. 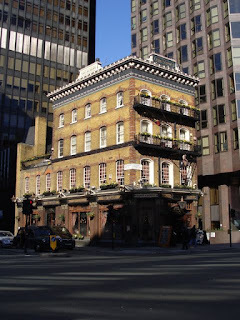 I take some photos on the south elevation and then go in to find the Virgin. She is quite remarkable, an earlier window (three panels) set into a later window. She attracts a great deal of attention with her periwinkle robe and halo. So I walk around the cathedral inside - it is too cold outside for walking or photos. I buy a book and meet a couple of Americans from Wichita, Kansas - a priest and his friend, and we have a pleasant conversation. I never do find the baptismal font. I take some photos on the north side, and decide to go back to the train station. I have planned badly - my train won't arrive for another hour and a half. So I go have a hot chocolate, and read my book. Only later do I go to the station and wait in a half-warm room (a French school girl sees the radiator I am standing next to, and rushes over with her friends. She touches the radiator, and pronounces froid with all the derision her young voice can muster.) I wait along with four drunks who are harmless and perhaps a bit amusing. 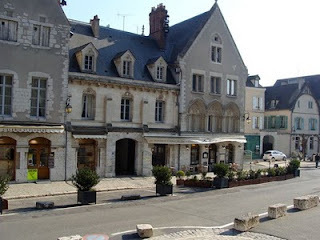 I go back to Paris, and to my hotel, having dinner at a favorite restaurant of mine in the Passage des Panoramas - Les Coulisses: escargot in puff pastry, and steak with green peppercorns. Satiated, I go home. Today is the day for the Tate Britain. 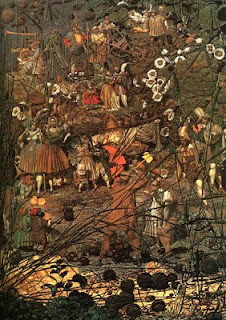 I'm hoping to see The Fairy Feller's Masterstroke which I first saw at the Tate in 1974. I sleep a little late, and skip breakfast and get myself over to Pimlico Station, where a sign at the door of the Tate greets all the visitors coming in - "Due to an industrial action (read strike) not all the galleries will be open today." I went in anyway hoping that some of them would be open, and went to the cafe to have a scone and some orange juice. Upon ascending into the galleries, and leaving my £3 in the suggested donation box, I soon find that nothing is available excepting an exhibition of Chris Ofili's work - which wasn't what I was looking for. I leave. Since I'm on a nostalgia trip, I go over to Selfridges, on Oxford Street - but nothing excites me there, so I go to St. Paul's. The last time I was here, the cathedral was bound in by really small and bad buildings, but the whole of Paternoster Square has been opened up, and is quite pedestrian friendly and attractive. I go in, but photography is not permitted. A mass will be said under the main dome in 15 minutes, so I go there and just sit. The verger (and here all the vergers seem to wear white tie under their cassocks, which are black) is busy moving furniture about, but soon comes out in a rather spectacular verger's robe leading two rather elderly priests, each in cassock and surplice and purple stole. The mass is standard Common Worship, which I find has used a lot of Roman prayers - ones that I like. The readings are obtuse, and there is no commentary, and the celebration is done with a paucity of manual gestures, and no elevations. All are invited to commune - and I think almost 100 people did. Hurrah for them! I go down to the undercroft to see the OBE Chapel and Nelson's tomb, and there is the veritable cafe - which I decide to avoid. I shall go elsewhere for lunch. I walk around seeing if I can find a place that I would like for lunch, and in the meantime take some photos of Christ Church Blackfriers, a ruined church just north of the cathedral, the Temple Bar gate, and other oddities. I find a rather small Wren Church, a guild chapel really, very small, and very Protestant. I finally have a nice lunch at Paul, and meet a couple from Italy. 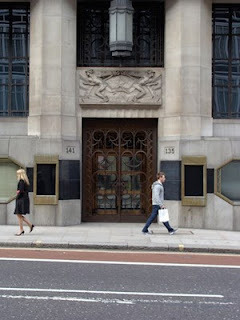 Now it's time to find Temple Church, so I walk down Fleet Street, and see some interesting buildings, among which was a art deco courts building. I bump into St. Bride's Church, which is in the middle of the block and spend a few moments there. I find the Temple Church by wandering around all the courts of the Temple area (which are very charming) but the church is closed. 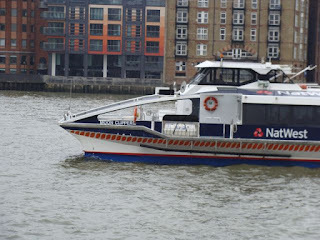 I am close to the Embankment, so walk along there for a bit, and then go home. I need to write my review of Gilead for the Trinity Book Club. There has been a great deal of talk in our time about the separation of church and state, and although I believe in that principal, I think that it barks up the wrong tree. There is not an established church in the United States, but there is a dominant theology. It is this theology and its various interpretations and manifestations that need to be separated from the State. I am speaking of the Calvinism, more specifically the predestinarianism that informs Marilynne Robinson’s excellent book, Gilead. This theology of predetermined results has freed our society from wrestling with many evils, and that is what she writes about in Gilead. I’d like to talk about it on a variety of levels. On a personal level, I felt as though the author must have camped out in my life, or in the life of my father, or in the lives of the long line of Lutheran pastors and teachers that preceded us. Interestingly enough, predestinarian controversy inserted itself in my own family’s life, when my great great grandfather left the Ohio Synod of the Lutheran Church over this issue, and joined The Lutheran Church – Missouri Synod. My großmama was much upset when I and my brother, and my cousin Paul all reversed the trend, and left the Missouri Synod. I know the power of these concepts. I wonder how many readers can apprehend this book – there being so many arcane, and now culturally irrelevant references. My mother was born in the hill country of Kansas in a small town near Topeka called Alma, Kansas. 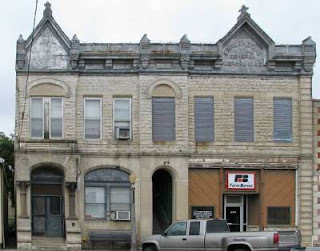 In this town you were either Lutheran or Catholic – they shared a block upon which Holy Family Church (Catholic) and St. John’s Church (Lutheran) sat. I loved all of the references to the prairie, and was amused at the back seat that the Lutherans occupy in this book. This is really a book about the Reformed Church (with roots in Switzerland, France, and Germany) and fellow players, namely the Presbyterians (Scotland), and the Methodists (reformed Anglicans, England). In this town of Alma, the Methodist minister was run out of town, when during the First World War, he made disparaging remarks about German-American citizens. A way of apprehending the book. As I read this book, a physical diagram formed in my mind and helped me to understand what I thought the book was trying to capture and report. The diagram is noted below, and includes what I think are the major characters and the rôles that they play in this excellent theological treatise (I mean, novel). At the center of my cross (and the symbol is intentionally used here) John Ames, the narrator, is the passive observer of the theological, political, and social forces at play all about him. On the cross beam, he occupies the place of the observer, and is sort of the Hegelian “synthesis” to the “thesis” of his grandfather’s radical Christianity, and the “antithesis” of his uncle’s agnosticism. Although Edward does not take up much type in this book, he anchors one half of the equation. 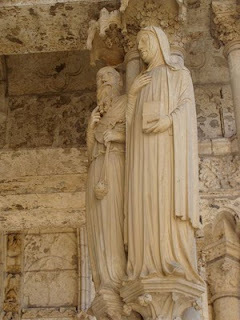 The upright is formed by the father and the two sons. One (Jack), is the total experience of the past, full of all its trials, temptations, faults, and misdeeds. The other is the true son, innocent, all future, all unknown, in formation. This diagram helped me read the book. Fathers and Sons: Once I stood with my father on the balcony of my sister’s home on Bernal Heights. Everyone else was partying, but we had a moment to our selves. He was having a very difficult time with my being out as a gay man, and I think still smarting that I left the church of his fathers. I asked him, “Do you still follow all of the values, and precepts of your parents? Have you ever developed a viewpoint that is truly your own? He looked at me for a few seconds, and then he said. “No.” And that was that. 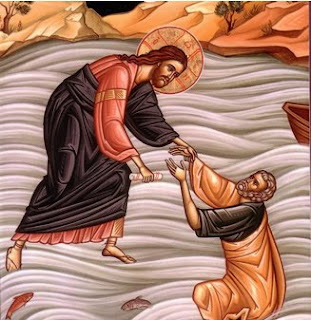 The dynamic in Giliead is the knowing rejection (perhaps that is too strong), moving beyond the vision of the father to something else. Sometimes there is conversation about that transaction, but just as often there is not (John Ames’ father moves East to live with Edward). The problem of sin: I found especially interesting the story about Jack and the car, which he stole, and abandoned. All kinds of folk become involved in his “sin”, so that no one individual can properly be removed from the problem. 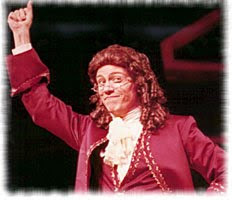 It reminds me of the song (Auto da fe) that Dr. Pangloss sings in Leonard Bernstein’s Candide, in which he recounts how the syphilis that he receives from his paramour Paquette, which then goes around the world so that by the last verse he is infected again. Jack sin infects a whole circle of people. 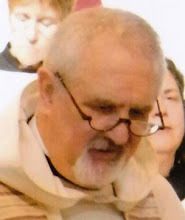 The grandfather, to use a Lutheran phrase (pecca fortiter) sinned boldly – and to good effect. Edward didn’t believe in it. And the picture we have of the son, a common Anabaptist concept is that the child is innocent of all this. I was amused at how kind sin could be, when Jack is visiting his “wife” Della following the birth of their son, he comments on how nice the women were being to him. They were lying of course – they despised him and what he had done, and he understands it perfectly. “They were just being Christian”, he comments. Fathers and Sons II: I was terribly moved when John Ames pronounces a benediction upon Jack. Because of my own history, scenes of reconciliation between fathers and sons effect me deeply. It is interesting that John Ames comments on the gesture that Jack often makes, of touching his face in delicate moments. And yet it is this same gesture that is used at the benediction. I wept. I loved this book. I loved all the nooks and crannies that were familiar places to me, and the physical scenes that seemed so familiar. I loved its language and cadence, and its still, small, quiet voice. If you are interested read: I Kings 19:8-13. Thanks, many thanks, to whomever selected this book. The particulars about the music are: Setting: Western Wind Mass by Sheppard, Offertory: In ieiunio et fletu by Tallis, and the Communion: In manus tuus, by Sheppard. Fiddleback, sung Epistle and Gospel; oddly enough the Celebrant sang everything recto tono, but the others were quite good. The angelus was said, not sung, following the service. All of this brought back memories of Pete Bastien, Paul Lutze, Mike Gruel, Jeff Zetto, Dennis Kohl, and John Jurik (and myself, of course) gathering together in Massachusetts to do Luther's Formula Missae et Communionis in full pontifical style. The physicality of the building is quite wonderful, with a baroque altar, wonderful carvings, and paintings. I really felt as though I could worship. I shall have to thank my friend Sanford Maclean for such a good recommendation. 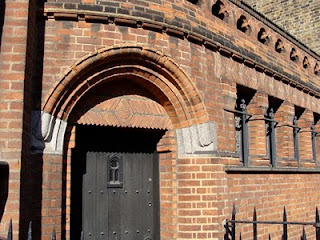 Leaving the church, I noticed the brickwork combined with some granite - quite handsome. From there I walked up Eaton Square in the general direction of Westminster Cathedral. In the sun it was quite warm, and it was pleasant walking in this particular neighborhood. People keep asking me directions, and I, surprisingly, know where to direct them. I arrive at Westminster and a mass is in full swing, so I just look inside. I wanted to see if they were going to use the Extraordinary Form (in other words, not facing the people). The altar looked as though it was prepared for that kind of celebration, but they were only at the Epistle and that would have meant waiting out another sermon, so I went on my way. I had an interesting English lunch at the Albert in the carvery on the second floor where the waiters all seemed to be American. It was rather ordinary, but heartening in a funny kind of way. Paté with a curious relish of raisins and preserved citrus, and salad, with ordinary toast, Roast Pork with a bland stuffing, cooked apples, a roasted potato, and a yorkshire pudding, was the fare. It was way too much food, but the price wasn't bad. 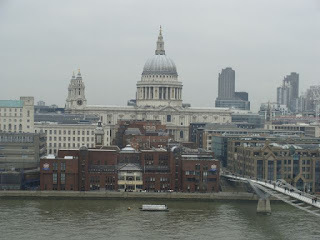 From there I walked over to Saint Margaret's, the parish church cheek and jowl to Westminster Abbey. It was open so I went in, and someone was playing the organ. I took an illegal photograph (above) and walked around a bit. The window over the entrance to the nave is devoted to Elizabeth I. There are some religious windows, some not surviving WWII, but this is definitely The House of Commons Church. The altar cross was awash in a sea of politics and history. When the organist decided to do The Ride of the Valkyrie, I decided to make a hasty retreat. 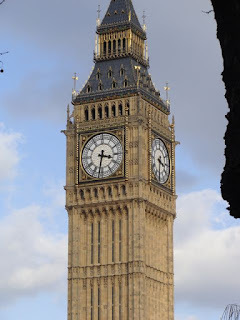 I walked the short distance to Westminster Abby and saw a knot of people at the front entrance gate shaking their heads and leaving - and thought the worst of it. However when I got there, and asked about Evensong, they ushered me right in. Directed down the left aisle by a phalanx of stewards, I came up to the great crossing. The usher looked at me and said, "That collar will get you a seat in the choir." And so it did - how they selected those of us lucky enough to sit in the choir remained a mystery to me. Most everyone else was relegated to the transepts. This is as good as it gets (although perhaps King's would be better). Evening Prayer with sermon: we got to sing two hymns, and the quire did everything else - including the responses. It was lovely - and the tone! Prior to the office, the organist did the Persichetti Organ Sonata. Again I thought of old days, when I turned pages for that piece. The sermon was actually alright - urging us to make use of sacred places and to be inspired by them. I stay to hear the postlude, and then decide to walk back to Trafalgar by way of St. James' Park and Admiralty Arch. It is sunny but cold with an almost bitter wind - but the sun does it's best. 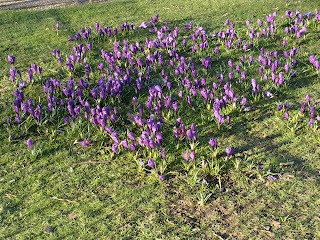 In the park I find daffodils ready to pop, and some brave crocus in purple splendor. On the way I notice a modern sculpture that stands as a monolith next to a dark and modern building. I thought about statues again, and I wondered what this one has to say. Perhaps our time has little to say, and plenty to be worried about. Now I'm looking for tea, and perhaps a concert. I missed a chance last night for the Fauré Reguiem. 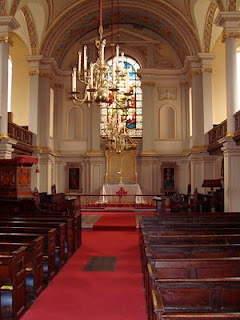 But there is no offering at St. Martin in the Fields, and the Café which seemed charming yesterday is loud and noisy. I go to a small place up near Leicester Square, and have a dessert made with black currents - quite good, and run by Germans! I make my way back to Charing Cross, and take the tube home. It has been a fulfilling day. Today is my sister Wendy's birthday, and I will spend the entire day thinking about her, and giving thanks for her place in my life. I thought of her especially yesterday at Stonehenge with the sheep grazing all about the monument - sheep grazing with great dignity. Wendy appreciates that in animals - just their presence and dignity. Today it is the British Museum, and I skip breakfast at St. Katharine's and proceed to get on the train, getting off at Bank and going over to Charing Cross. I do need something to eat, and look around for a Tea Room, but don't see anything that suits me. 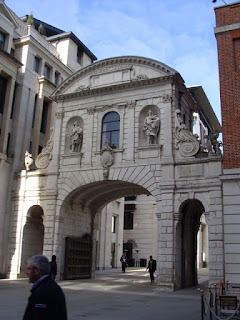 Then I notice, between St. Martin in the Fields (a wonderful Wren church) and the building next door a kiosk with a stairway leading underground and proclaiming, "The Café at Saint Martin in the Fields". 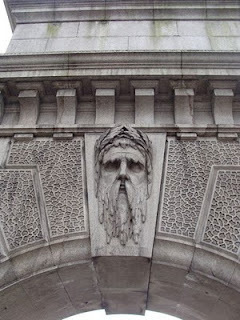 (These are apparently quite common, having seen one at Westminster Cathedral, and at the Methodist Central Hall.) So I go in and have a delicious Spanish Tortilla with aioli, and an orange juice. The last time I was in this church was in 1974, and I was in agony - only day 2 into a pair of new shoes purchased for my first European trip. 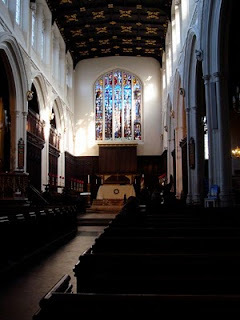 So my memory is clouded with pain, recalling only a very dark church, a most welcoming pew that I sat in for some time, and a humorous story about one of Joanne's colleagues, Dr. Edna Parks, being mistaken for Her Majesty, the Queen. All of this came flooding back, and I was unprepared for all the light. The window behind the altar has been replaced with a rather modern thing - can't tell whether or not I like it. They were preparing for a concert that was to be given that evening, so people were bustling about the chancel. The man in the foreground gives you an idea of how bright the room as become. There were many touches about the room that I had never seen before or had forgotten. It was quite delightful. Trafalgar Square is always amazing to me. It was full of life. Some were there to be in the sun (after several days of gray). 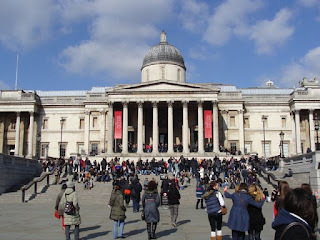 Some were there to go to the National Gallery, some to the Portrait Gallery. Some were just walking through. Some were there to protest something - it was a voice with an Irish accent, but I kept hearing "Iran", so I don't know why they were there. I knew why I was there - it was for the National Gallery. Oddly enough, when Jo and I were here in '74, we didn't go in! Now it was time to make up for lost opportunities. It's difficult to do in an orderly fashion, so I just started out - didn't worry about chronology. The painters that jumped out at me were Zurburan, Holbein, Turner, and Saenredam, and there were several others that I had never heard of before. 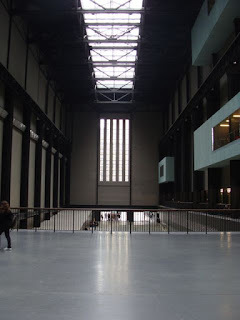 The new (to me) Sainsbury wing is quite nice, and having revisited the arguments about what this wing should look like, I'm afraid that in retrospect I have to agree with Prince Charles. Venturi and company accomplished a nice post-modern building. My friend, Paul Groth may not agree. I haven't talked much about food - well I am in Britain, after all. For lunch I went to the museum restaurant and had a Lentil and Lamb Pie that was just extraordinary. Those Cornish pies and pastries are just wonderful. My back is beginning to bother me, and it is cold. 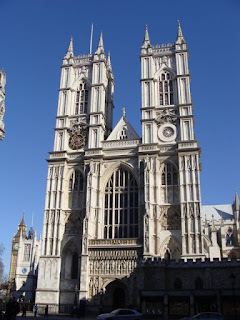 None-the-less I decide to walk over to Westminster Abbey, down Whitehall. A thought comes to me, that was formed a bit at Windsor, and comes to full bloom as I make my way past all the government buildings. It is about statues. We need more of them. We need them to be of people who have stepped up and out and have done something for society. I am thinking about the King Memorial in San Francisco which is photographs and words. Most, people who visit there, I think, don't read the words - they look at the spectacular water. Statues cause us to pause and say, "Who was that?" Yes, we need more statues to lift us out of egalitarian ignorance of great women and men, and to honor their departure from the ordinary to the extraordinary. Here's to you, Winston! Westminster is closed, St. Margaret's is closed, and I am a half hour late for Even Song. Even more so I am tired and cold. So I go home, buy some chicken (good! ), and curl up with Marilynne Robinson's Gilead. The cursillo people are walking about the place singing an American Spiritual (I am reminded of Marilyn Jackson's comment during a procession on M. L. King, Jr. Day at Saint Francis while we were singing Lift every voice and sing, "Give it up white people!") carrying candles and generally making a nuisance of themselves. Ah, people. How wonderful to be alive. The scrim has descended again, but that's because I read email before writing today's journal. I didn't go to Morning Prayer this morning. There are a bunch of people here making a Cursillo, and they want to be by themselves. In fact, I had to leave early to get to Victoria Station by 8:45, so that I could catch my tour to Windsor, Stonehenge, and Bath. I don't normally do this kind of thing, but this was relatively low impact (no heavy guide) and it got me to the places I wanted to go. I get there early, it's quite a walk from the Underground to the Coach Station and its 4º C outside, and quickly get a cup of coffee and a Cornish Pastie. It's not a bad group of people, excepting a trio of young Americans who trumpet their ignorance of history and culture, and are constantly late. 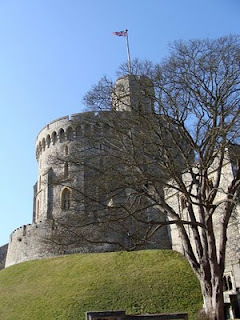 We make our way out of London on the M1 to Windsor, and I tour the state apartments (no photography allowed) and St. George's Chapel (same there, as well). The one thing that impressed me at Windsor were all the Holbein drawings and paintings. I saw many things that I recognized from books. Windsor, since it is a working palace, is too clean. It doesn't have that patina of time such as you see at Sans Souci, or at Versailles. And there are ushers everywhere, all very polite. In the chapel, I realize what a complete fusion there is of Church and State here. 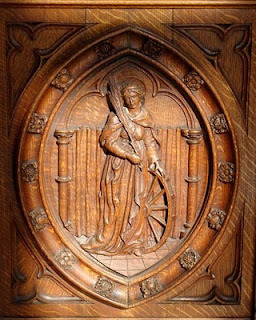 It was most evident in the choir of the chapel, where heraldry outplays any Christian symbolism hands down. We saw this in Switzerland, as well, where cantonal, or national symbols replaced Christian symbols. The Germans didn't seem to fall into this pattern - perhaps because there was no Germany. (One exception might be the ruins of the Kaiser Wilhelm Gedächtnis Kirche in Berlin - where Hohenzollerns seem to mix into the Byzantine symbols and devices that they seemed to love so much). I was surprised at how many chantries there were. One was filled with chapel chairs, extra candles, kneelers, and other liturgical equipment. If it were my chantry, I would have been pissed. I grab lunch to go - we're going to eat on the bus as we make our way to Stonehenge. I had imagined this in some other part of England, for some reason, and was surprised at the approach one makes from the northeast. The guide tried to quiet our expectations. I'm certain he's heard more than once that "it's so small." The approach was impressive, it hovering over the roadway, completely approachable. Walking around the ruins, I found it to be soul-stirring somehow. There were sheep grazing all around it, which seemed appropriate and a relief. In spite of the fact that there were numbers of people there, I did feel as though I could experience it by myself. After buying a book and a wonderful cherry shortbread, we are on our way again - this time to Bath. 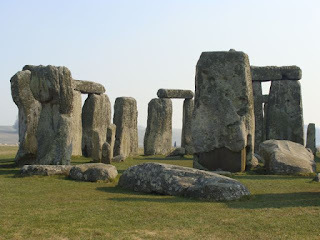 As we leave the Stonehenge site we begin to see all of the other pre-historic archaeological sites that accompany it. There's talk of pulling it all together into one National Park - I hope they do - I hope I can come back when it's done. 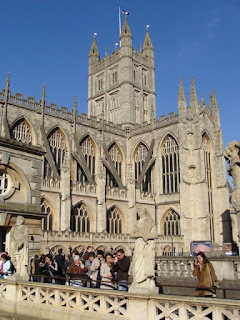 We park by the Abbey, and I realize that there will be dessert following the baths - a church! The baths are OK. Having been to the ruins of a bath on Massada, and similar ruins in Rome, this seems a bit tame, but enjoyable. 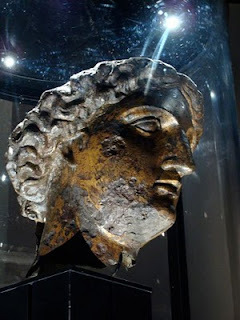 The air is full of mist and sulphur as we walk around the ruined baths, and there are some quite nice archaeological treasures - especially a gilded bust of Minerva. The church is calling me. It looks like a fine piece of Perpendicular Gothic. Built in the late XIVth Century, and having supplanted a ruined Norman building, this is late on the gothic scene. 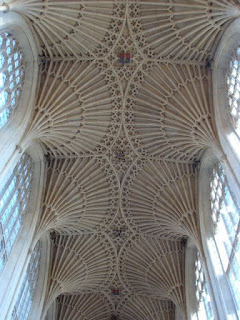 And the ceilings! The church has the nickname, "The Lantern", because of all the marvelous light that suffuses the place. 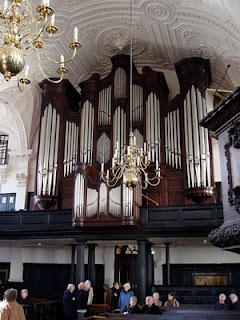 There is a wonderful Klais Organ (Bonn, Germany), but no one is playing it. There are "stewards" all over the place, ready to answer questions, and there is a "prayer trail" inviting visitors to try and worship. And there is a bookstore. 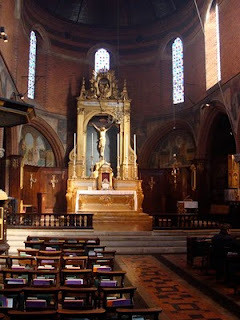 I succumb to a copy of Common Worship - Daily Prayer, which has enthralled me during my stay at St. Katharine's. I meet a couple from New Orleans, and we talk about the church and other places that we have visited, as we await the return of our bus. I sleep my way back into London, and come home very satisfied. Now, to work on my ego. I arrive late for Morning Prayer - it was early because it was to be followed by a Eucharist at 8, which I stay for. There are only three of us, priest included. I marvel at how all the liturgies descended from the work of Cranmer have diverged - how there isn't a sense of cooperating, at least with the English versions. Some prayers are distinctly the same, others are totally new to me. It made me pay attention during the liturgy. After mass, I have a quick breakfast alone. No one is really in the refectory. I leave and grab the DLR, this time getting off at Bank, and going over to the Center line. My goal is the British Museum, and once I alight at Tottenham Court Road, become totally lost, wandering around Covent Garden like a lost soul. It seems that what I thought was north was actually south - grey skies will do that to you. However there was something good that came out of it; I bumped into St. Giles in the Fields. 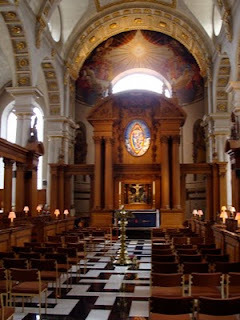 From the exterior, which is Palladian, I thought that the church might have been a Wren, but no it was by Flitcroft. 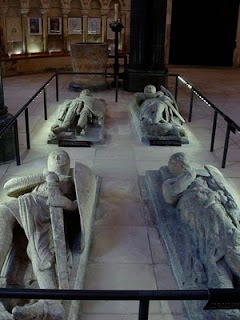 Interestingly, it was founded by Queen Matilda, the same patron who founded St. Katharine's. This building was the third such building, the second, consecrated by Bishop Laud also figured in heavily during the Plague. Also of interest is a pulpit used by both John and Charles Wesley. 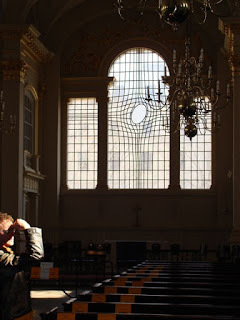 What struck me was the interior, bringing back memories of Old North Church in Boston. The stained glass in the chancel is the only such glass in the building (luckily all the Victorian glass was blown out in WWII), the nave lights being plain glass. 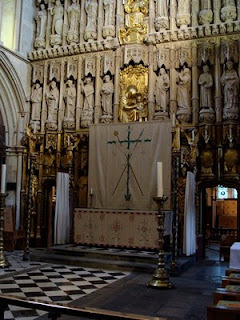 The tables of the law are also mounted in the chancel. I took some time there to sit and think (and figure out where the British Museum actually was). Although the buildings at the Museum are impressive, it is Norman Foster's Great Court surrounding the reading room (which was closed, unfortunately) which gives the place a sense of place and wow. I found myself just having to walk around it a couple of times to take it all in. Like the Louvre, you don't quite know where to begin. So I bought a map, and noticed a large pharaonic head, and started there. One is properly greeted with the Rosetta Stone, and once again I was stunned. It brought back to mind the first time that I went to Paris and the Louvre. 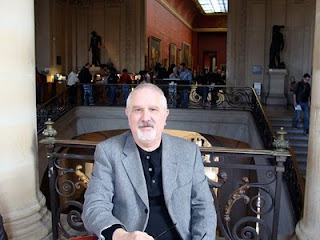 (My sister, Bonnie, had advised me to enter the building, rush to see the Mona Lisa, and having gotten that out of the way, to enjoy the collection). 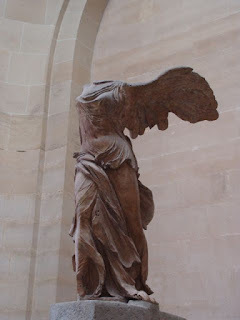 As I left the Mona Lisa, I wandered down to a staircase and was suddenly confronted by the Nike of Samothrace. I stopped, and I cried. Not only was it of immense beauty, but it was true. All the things that my father, Professor Norman Gienapp, and others had shared with me from art history, literature, and music was true - and it was summed up in the sculpture. 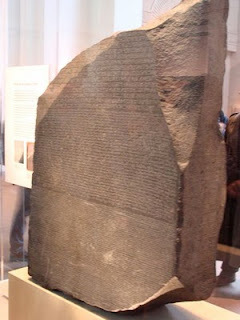 The Rosetta Stone proved to be a similar experience, although without the tears. 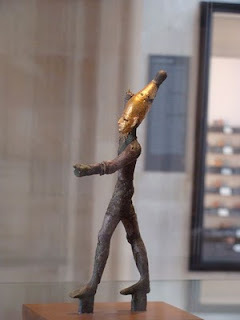 I took my time in the Egyptian Galleries, taking it all in. At the far end of the Egyptian materials I came upon another piece that I had known about since studying biblical languages, and that was the Stele of Shalmaneser III. What is interesting about this piece is that it depicts one of the kings of the Bible. There he is, above, Jehu, the King of Israel (the Northern Kingdom) offering his obeisance and his tribute to the Great King. Like the Louvre and the Pergamom, there are lots of Assyrian, Chaldean, and Babylonia cherubs lurking over the visitors to the museum, intimidating us as they did the visitors or captives of these ancient empires. 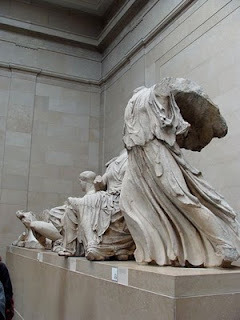 Next were the Greek Galleries, and of course, the Elgin Marbles. Interestingly, rather than ignoring or downplaying the issue of these objects and the request of the Greek Government that they be repatriated, the museum had published a brochure stating their position. These sculptures are truly stunning, and they are displayed in a large and gracious space (in spite of all the French school children running about) that you can walk around them and truly take them in. I realized that I was only going to be able to touch the surface of all this - but to immerse yourself in the totality of it all was truly wonderful. It was time to have something to eat, and realize that the Roman curse had reappeared. 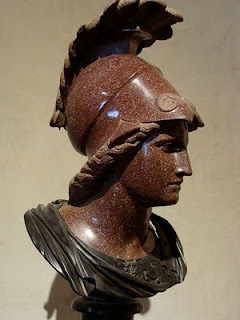 The Roman curse is a pain in my upper back that I first experienced last fall in Rome, and then later in Potsdam. I think it may be due to carrying a heavy briefcase for 24 years. At any rate a Margarita (the pizza) and a Limonata seemed to help a bit - that and sitting at a chair with a back on it. 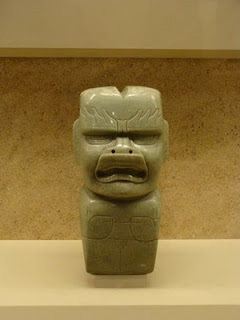 Now I concentrated on some galleries where I knew that I would see things I have treasured in my mind for years. 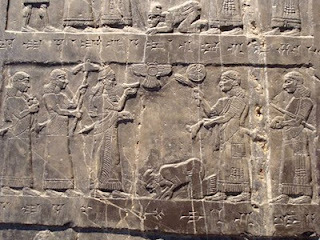 Materials from Nineveh, Syria, Babylon, Sumer, Agade, and Ur were all there. 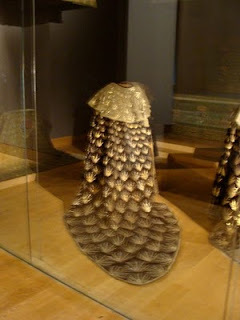 There were ivories (see above) and gold - especially the headdress from the Royal Tombs at Ur. 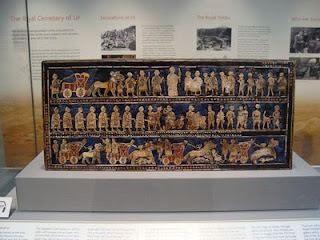 There were reconstructed musical instruments, legal texts, religious texts, and objects that I had read about and been interested in continuously. Some seemed smaller than I had imagined them, such as The Goat Caught in a Thicket, or the Standard of Ur (below). Seeing them at all, however, was a real blessing. 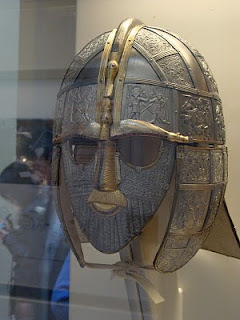 One of the exhibits that I really wanted to see were the materials from the Ship Burial at Sutton Hoo. I had heard about these treasures before, but have recently run into them in my reading of The Inheritance of Rome, by Chris Wickham. These treasures and the history that has been inferred around them, makes one realize that one is always a student of history, never its master. There was the Enlightenment Room, George IV's monument to rationalism, and Olmec and Mayan treasures that took my breath away. It was 3:00 - and time for Tea. There is a wonderful restaurant on the upper level of the Great Court, that sort of wraps around the Reading Room. There I had tea and a lemon tart, and watched and listened to the people around me: two gay men having tea and dishing, a man and a woman trying to impress each other, a couple of uppity women who pissed off the wait staff and were subsequently ignored by them, four Chinese women who wanted more types of tea than the establishment offered, and finally two Arab business men and their English client/contact, with the Englishman laughing in that disengaged manner that seems something of a stereotype - but there it was. Too much fun, watching other people. If Arthur had been with me, we would have surmised stories about each of them. I spent my last moments looking at a collection of Mexican revotionary books, posters, woodcuts, etc. that were quite engaging. I never realized that Orozco was such a firebrand. Off to the side were some woodcuts by Dürer and Mantegna that brought me back to my roots. Finally a room filled with Indian and Chinese buddhas, and all their wanna bes formed in granite, basalt, and lacquered wood. My camera battery ran out - so I new it was time to go. On the way to the tube, I looked at St. George's Bloomsbury, whose architect stuck a copy of the Tomb at Hellicanarsus on the church's bell tower. Appropriation - that's what empires are good at, and perhaps the British Museum's argument that they can take care of it best makes sense. I know what all of this appropriated material has done for me, but what might it do for someone whose roots are part and parcel of these objects? I meant to close yesterday with a comment about St. Katharine's wheel. 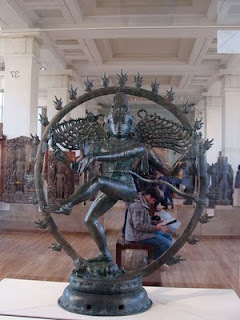 It was the means of her torture and her demise, and when I came across this dancing Shiva, locked in the center of the wheel of fire that is life as we know it, I remembered Katharine's wheel. We come to a place, leave it and move on, and come back again - a rotation of memory, experience, and deeds. Perhaps that is what I am here to learn - where am I in this dance?